Read More Reviews and Order Now! Four familiar friends invite preschoolers to explore this adorable garage. 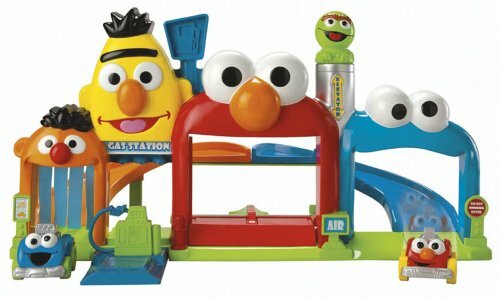 Pull the cars up to the Bert gas station; then ride the Elmo elevator to the top. The platform tips forward so the cars can race down the Cookie Monster speedway ramp or enter the Ernie car wash ramp. Fun phrases from each character accompany all the action. Requires 3 "AA" batteries, included. Measures 7.75"L x 19"W x 9.25"H.